Getting sick or injured in the Toronto of the 1820s was a terrifying proposition. 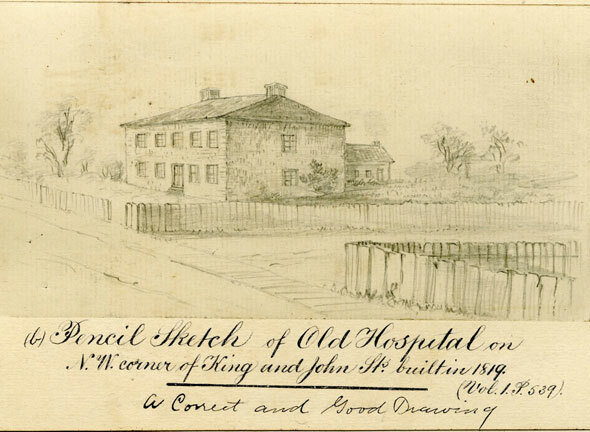 The city's first civilian hospital, a basic brick building at King and John streets, was staffed with caring military doctors from Fort York, but even diseases and infections considered easily curable by modern standards were potentially fatal. The road to world-class healthcare in Toronto would be a long one. The first medical centre, one of three general hospitals in the city's history, was funded with a gift of £4,000 from the Loyal and Patriotic Society, a charitable group formed in the wake of the War of 1812 that provided for widows and orphans of fallen soldiers. The start-up cash was what was left in the group's account after everyone had been looked after. The structure, which hugged the southeast corner of the lot, was designed by John Ewart, the architect of the original portion of Osgoode Hall. It cost £3,000 and covered just 4,356 square metres of the sprawling lot that stretched as far west as Peter Street. Spread over two floors, the size was considered adequate for the population of a little under 20,000 people. The final bricks were still freshly in place when the provincial government commandeered the building for use as a legislature. Upper Canada's second parliament building, built at Front and Parliament streets to replace the one torched by invading Americans in 1813, had accidentally burned to the ground, and the members needed somewhere to meet. Five years later than scheduled, the building was turned over to the town's sick and ailing. It was good timing too--a measles epidemic that year ensured the doctors (and undertakers) were kept busy. The biggest test for the General Hospital came in the summer of 1847. A devastating famine in Ireland forced thousands, many of them sick with typhus, to flee the country for the new world. 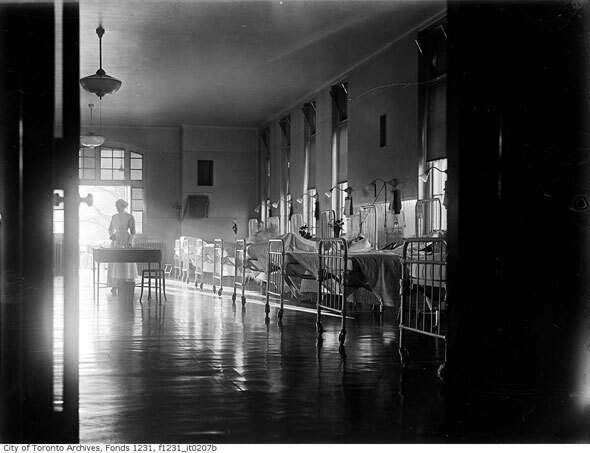 Though there was a screening process designed to block anyone with symptoms of the dread disease--red rash, severe fever, delirium--reaching Canada, up to 1,000 sick people landed in Toronto every day, overwhelming the town's modest facilities. Many more died on the ocean crossing and were buried at sea. Sensing the impending crisis, Bishop Michael Power, the first Roman Catholic Bishop of Toronto, lobbied for the construction of wooden "fever sheds" that were built on the hospital grounds as overflow wards. Power ministered to the sick beside the doctors and nurses until he, like so many others, died from the disease. Many of dead were brought to St. Paul's Basilica on Queen Street East where the coffins were laid in rows at the bottom of giant trenches--there was no time to dig individual pits. St. Paul Separate School and the ramps to the Don Valley Parkway at Power Street now cover the place where the bodies were buried. The typhus tragedy underscored the need for a bigger hospital, but funding was limited. The city's population was rapidly expanding and the John Street building was woefully inadequate. It was, however, sitting on an increasingly prime piece of real estate. The city decided to sell the land and move the hospital elsewhere. In 1854, the second Toronto General Hospital was completed on the northwest corner of Gerrard and Sumach streets, close to the Don Valley, a location chosen in part because of the cheap price of land. As assistant University of Guelph professor Jennifer Bonnell recalls in her thesis on the Don Valley, an editorial in the medical journal of the day argued against the east-end location due to the prevalence of ague, any one of several illnesses characterized by fever and chills, and its remoteness from the central city. "Only picture to yourself," the Upper Canada Journal of Medical, Surgical and Physical Science wrote, "the necessity of conveying in the middle of winter, perhaps upon a shutter, any poor man who may chance to meet with a serious accident at the western end, a distance of four or five miles, before he could be received into hospital." Despite the concerns, the 22-ward medical facility opened in 1856 with room for 400 patients. There was space dedicated to "extreme surgical cases," a maternity ward, an operating theatre complete with viewing gallery (directly above the morgue,) an eye and ear unit, and even "a chamber for a museum" on the upper floors of one of the towers. The building was designed by William Hay, a Scottish architect responsible for two of the original buildings of St. Michael's College and Yorkville Town Hall. It cost £17,000. "The style is old English, partially modified," The Globe reported in December 1856. "The most novel and original features in the edifice are the roofed towers. These give a singular boldness of character and outline to the entire structure, which is simple and free from extraneous detail, but grouped into a remarkably pleasing composition." 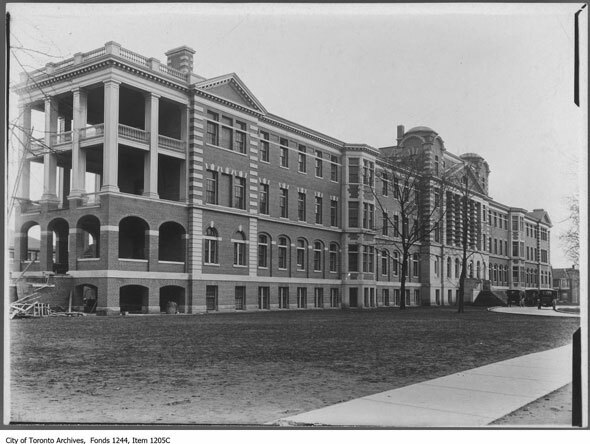 The Toronto General Hospital on Gerrard was the city's principal medical facility for 60 years. In 1861, a nursing school, just the second in Canada, was added to the grounds. TGH moved to its present location on College Street in June 1913, 101 years ago this week. The central brick building is now part of the MaRS Discovery District. Simple historical plaques are all that mark the location of its predecessors.